Here at Jiwa Damai, we are currently in the process of adding to the retreat center with the construction of two Balinese lumbungs. A type of traditional Balinese housing, lumbungs are small, two-story bamboo huts that are open to nature. Ours sit on the hillside and have a scenic overlook to the jungle and swimming pool. The first floor has of the lumbung will feature a couch, living area and patio with large hammock. The second story is a bedroom. The lumbungs are for guests who want to be closer to nature. Here, you will be sleeping open to hum of cicadas, singing of frogs and croak of the gecko. The patio provides a perfect place for meditation and yoga. 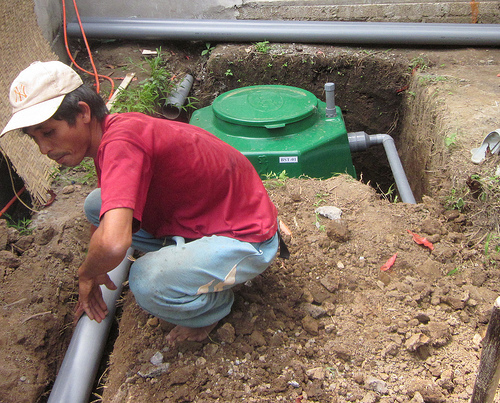 In our efforts to be the forerunners in environmental friendliness and to pioneer energy efficiency in Bali, we have installed a BioPro, bio septic tank for the lumbungs. We considered a solar water heater but ultimately decided that it was not worthwhile - too many rainy days here! Our bio tank is one of only two pieces available on the island. The pipe runs, as pictured, from the lumbung bathroom into the bio tank. From there it goes through a treatment process. Clean, recyled water flows out at the other side. The outflow of the tank will be used to water the upper garden. This will be particularly useful during the dry season, when every drop of water counts.